The NewLife® Intensity series combines high pressure with high flow to create up to 8 or 10 LPM, operating with reduced power consumption. The NewLife® Elite concentrator delivers up to 5 LPM of therapeutic oxygen in home, hospital, and clinical settings. Units are available with an optional O2 monitor. NewLife Elite can also be equipped with a pediatric flowmeter for use with infants and other patients prescribed for low liter flow (0.125-2 LPM). The Air Outlet option enables the unit to deliver medicated nebulizer treatments while simultaneously providing supplemental oxygen. 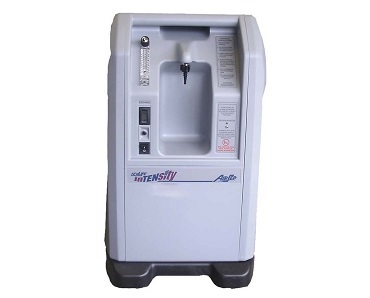 With an outlet pressure approximately three times higher than most other concentrators, these units are designed to serve special applications, such as with the use of large volume jet nebulizers, venti-masks, medication nebulizers, long oxygen tubing runs, and tracheotomy setups. NewLife Intensity dual flow units can provide additional power savings by delivering oxygen to two patients simultaneously up to a combined total flow of 8 or 10 LPM with one unit. Includes: 1 AirSep NewLife Intensity 120 V, 60 HZ, RE-MFG, english manual and 1 year full warranty.